MP High Court Civil Judge Mains Admit Card 2019 is Out. The High Court of Madya Pradesh had released the MP Civil Judge Class II Admit Card 2019 @ www.mphc.gov.in. Candidates who are going to attend for the written examination on 26th, 27th April 2019, they should download the MP High Court Civil Judge Hall Ticket 2019 from here. Through this article, we have provided more information about the MP High Court Civil Judge Grade -II Admit Card 2019. Moreover, at the end of this page, we have given a direct link to download the MP High Court Civil Judge Admit Card 2019. Additional information about the MP High Court Civil Judge Call Letter 2019 specified in the below section. MP High Court Civil Judge Admit Card 2019 is Released. As per the notification, the management of MP High Court had issued the MP High Court Civil Judge Admit Card 2019 and Civil Judge exam date officially. Candidates who have qualified for the prelims exam, they only will have to participate in the Civil Judge Main Exam. The Main exam for the MP High Court Civil Judge is conducted on 26th, 27th April 2019. The Sarkari Recruitment had provided the MPHC Civil Judge Admit Card 2019 from below given a link directly, and it is activated now. For more information candidates will have to visit the High Court of Madya Pradesh official website. In this table, we are providing organization name, position name, the validity of vacancies, exam date and admit card release date in a detailed manner. The MP High Court Civil Judge Admit Card 2019 is available now to download. The organization has officially uploaded the admit card for Civil Judge through official website www.mphc.gov.in. And this is the state level recruitment for who belongs to Madhya Pradesh. In every organization, the management will release the admit card one week before the exam, in the same way, we expected the admit card will be available 10 or 15 days before the examination. After the examination process, the results can also check in Sarkari Result. When download the admit card the applicants need to check the information. If the applicants find any correction then immediately inform the management of MP High Court. The High Court of Madya Pradesh will go to conduct the recruitment process for Civil Judge through written test and interview process. The organization will conduct the written test as a first round for screening the candidates because in these days everyone has shown interest in govt jobs like this. After the written test, the qualified candidates will need to face the interview. For more selection process the candidates need to check the official notification. The more details like notification, important dates, steps to download the admit card and others have given below. Without the MP High Court Civil Judge Admit Card 2019, the organization will not allow writing the examination. Through this admit card the management will easily find the fake candidates in the exam center. The admit card or hall ticket have essential details like Candidate Name, Photograph of the candidates, Exam name, Exam Center Name, Exam Center Code, Exam Center Address, candidates Address, Mother or Father Name, essential instructions for the examination. Everyone can attend in 20 minutes before the exam and check the information of examination instructions on the back of the admit card. The applicants must carry any Identity along with hall ticket for security reasons. The candidates can also check the All India Exams Admit Cards in one page through this article. The High Court of Madya Pradesh will go to conduct the recruitment process for Civil Judge through written test and interview process. The organization will conduct the written test as a first round for screening the candidates because in these days everyone has shown interest in govt jobs like this. After the written test, the qualified candidates will need to face the interview. For more selection process the candidates need to check the official notification. Admit card is an important document for every examination process. Every candidate has to carry the admit card because it contains the details of the participant and exam. The applicants who will not carry will not allow writing the exam. From the below-specified identities, candidates need to carry any document along with the admit card for the security reason at the examination center. Open the official website of High Court of Madya Pradesh www.mphc.gov.in. Search for the MP High Court Civil Judge Admit Card 2019 for the given position. 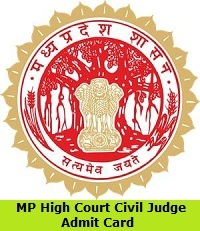 Click on the MP High Court Civil Judge Admit Card 2019 download link. MP High Court Civil Judge Admit Card 2019 will be shown on the screen. Download the MP High Court Civil Judge Hall Ticket 2019. Submit MP High Court Civil Judge Admit Card at the examination center with an identity. Through this article, we have provided almost all the information about the MP High Court Civil Judge Admit Card 2019. And hope this may be useful to who will complete the application process. If applicants have any queries, then leave a comment immediately. Follow the Sarkari Recruitment for more updates like recruitments, admissions, syllabus, etc. Thank you.